During my recent trip to Italy, I made the extremely spontaneous decision of, in the 11 hours between the end of my business and my train back, to make a quick dash for Venice. I spent a full 7 h there, so here are my insider tips for visiting this place – which is definitely worth it, no matter how short the time. The Canale Grande. Great to see when you did not expect to until some few hours before you actually do. 1. Everything is expensive in Venice. This includes luggage deposit at the station. It is 5 € for the first 5 hours, plus 70 cent per hour after that.It is also very much worth it. 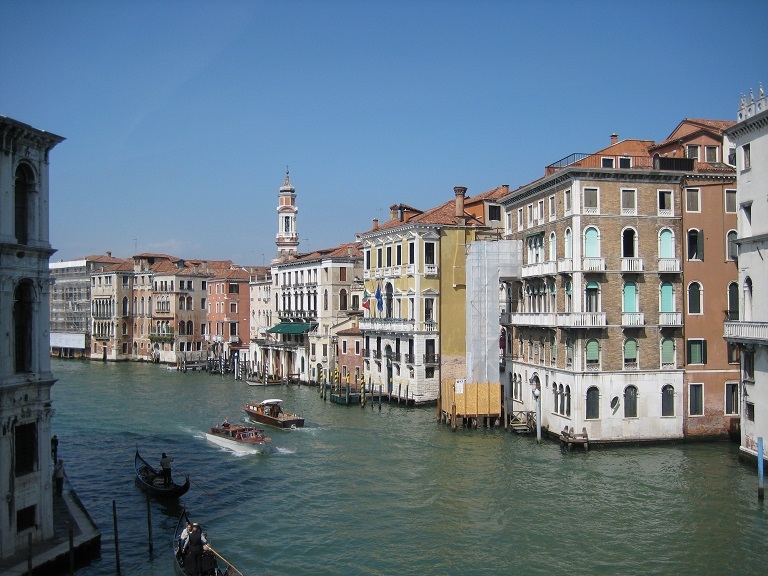 Venice, it is said, has some 400 bridges. I am not sure whether this can be right, because while I definitely visited only a small part of the main island, and did not retrace my steps to any large extent, I feel rather certain that I have covered close to that number of bridges during my stay. Keeping in mind that most of the roads are close to the water level, while bridges have to ensure that the gondolier can pass under them standing; this means: stairs. So, no fun with trolley suitcases. 2. Everything is expensive in Venice. This includes toilets. Public toilets are 1,50 € (!) in both station and city. The better option is to go to some non-too touristy cafe and have a cafè (or even a cappuccino, you wimp, even if it is already in the afternoon, because even there they will know that tourists will have cappuccino in the afternoon (the barbarians! ), and anyway, the coffee or cappuccino will be excellent, and no more than 3.50 €, probably, and given you can use the toilet for free (and refill your water bottle; do not underestimate the price of actually buying drinking water [is the running water there drinking water ?, my Inner German asks, only to be silenced quickly with no adverse after effects])) this is a great bargain. And, at least if you are female, you might try offering 50 cents for using the toilet without bying anything (in the less touristy areas, at least), and the good-looking barkeeper will give you access for free. Chivalry apparently survives in Italy. 3. Probably many friends will have told you how Venice is just not worth visiting, being stinky, decaying, and flooded with tourists. To which I have to say: Visiting in winter or spring may be a good idea, stink- (and probably tourist-) wise, compared to summer. Also: Yes, as soon as you leave the Piazza San Marco and its surroundings, much of the beauty of Venice is a decaying beauty. But then, it is decaying rather charmingly. Thirdly, you have to take the hordes of tourists as a sight in themselves. 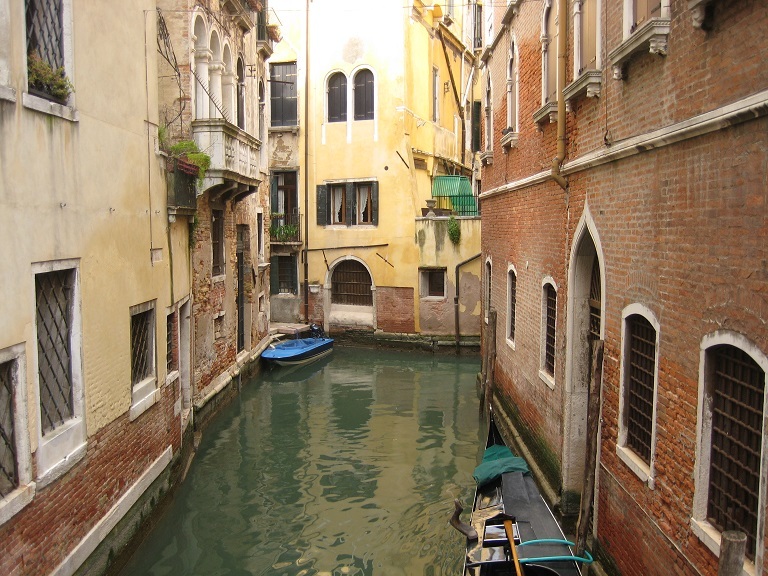 Of course the narrow alleys of Venice (some not much more than 1 m wide) were not made to channel 30 Mio. of tourists per year. Enjoy the incongruity. Enjoy also the groups of street traders, and if so inclined, make a sociological study of them. When I was there, there was a group of Indian-looking ones, selling rubber spherical objects in the shape of pigs, eggs, strawberries, and other things, which, being thrown down forcefully, dissolved into a puddle, just to re-solidify with a ‘pop’ again. This group changed, after dark, to the sale of propellor-powered, LCD-lighted objects that rise with great velocity to glide gently down. 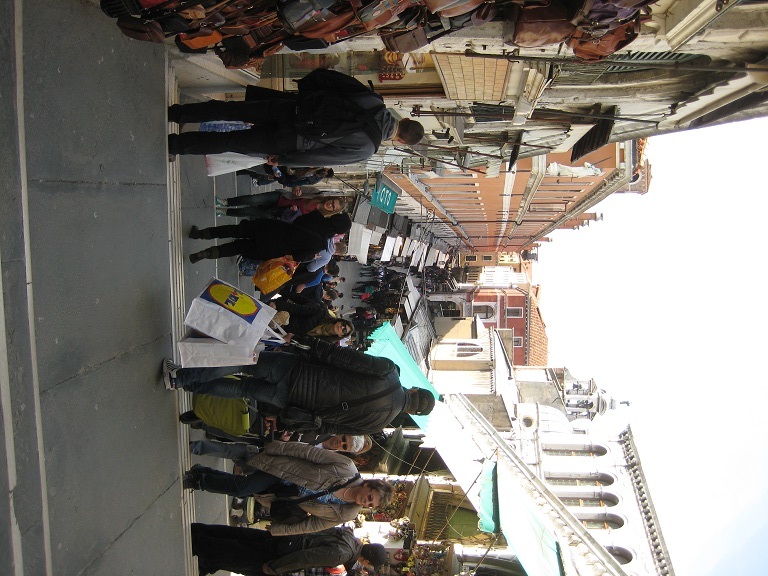 There was also a group of African-looking street traders selling handbags, apparently fake trademark ones, and the same models through the whole of Venice. Would have loved to make a better photograph of the pig-puddle, but did not dare to show any obvious interest, obviously. Well, you could not expect me to make a photograph when it was really crowded. 4. Somewhat connected to that: Decide, as you set your foot on Venice soil (or whatever it is you set your foot on there in this amphibious place), that you will not buy anything. I repeat this again for all female readers. There is an awful load of trash sold there (one word: masks), and an awful load of overpriced designer stuff, but in between, there is some rather fine and beautiful Murano glass jewelery, glassware, and the like. However, if you try to find these amongst hoax and trash, you will go mad. Believe me and ignore them, other than as a pleasant visual stimulus in the shop windows. 5. Venice is stunning. Walk into any random church, and you will find, casually displayed, the relics of some spectacular saint (like St. Roq), and/or frescoes or oil paintings by really famous painters, such as Tintoretto or Bellini. There are some few churches charging as much a 10 € for entry (ptui! ), but then, as you will wish to go to Mass anyway, just note down Mass times and go there then. In drastic contrast to my previous experience with Italy, nearly every church has a list of Mass times at their main doors. Did not go to that church (San Giorgio Maggiore, or so, I think), but probably has impressive relics/paintings/frescoes as well. 6. St. Mark’s Cathedral, can we praise it too much, does not charge you for entry. You are not allowed to take backpacks and luggage, but there is a nearby place, both advertised by placards at the queuing site, and yet extremely obscure in real life, and: for free (!! ), that takes your luggage for one hour (I took a wee bit longer on account of meeting a North American group having a very correct though swift Mass in English there, and no-one said anything to me.) 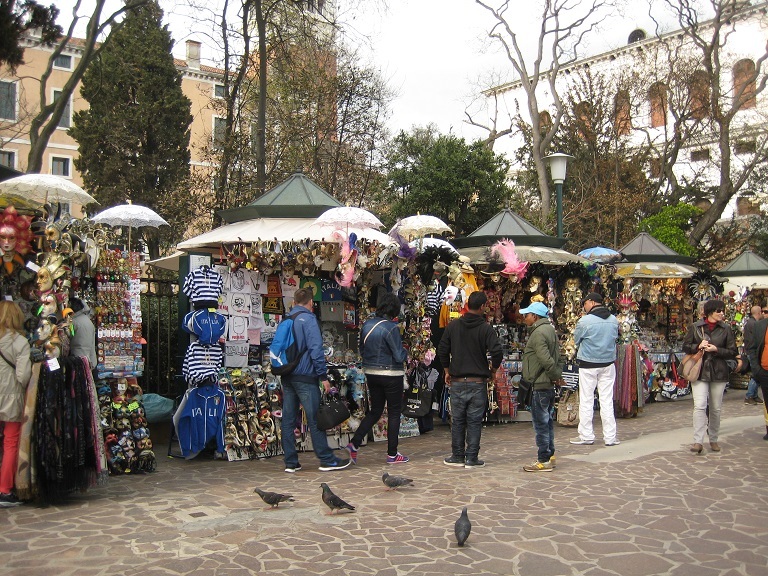 But: If you really want to get as close as possible to St. Mark, you have to pay (only 2 €, so no big deal). However, this is not for seeing the sarcophagus of St. Mark, but for seeing the Pala d’Oro. All right with me, in a way, but if not a good friend (Magdalena, who occasionally honours us with her comments here at Laodicea) had pointed this out for me, I would never have found St. Mark. His body is under the high altar (obviously, in a way, but then again so inconspicuously that one might very well miss him.) Now this is really impressive, isn’t it? 7. The Piazza San Marco, World Heritage Site. On first entering, I thought: Well, there it is. ‘s quite all right. It took me a while to get my mind into the frame of looking at it as what it is, and not at the thing seen innumerable times in photographs and films. Again, it was not made as a World Heritage Site. It was built, in the way it is now, in the 16th cent., and as far as the proclamation of ‘We have power, we have wealth, and we have good taste, too’ goes, it is probably the most impressive thing I have met yet. Yes, there are these Baroque and Rococco castles, but they seem to imply decadence as well as power and wealth. The Procuratie Vecchie, on the other hand, seems to imply ruthless efficiency. Looking at the Piazza and the pillars at the landing site, I still felt the slight terror of someone of a lesser power, or of lesser importance, landing in 16th cent. 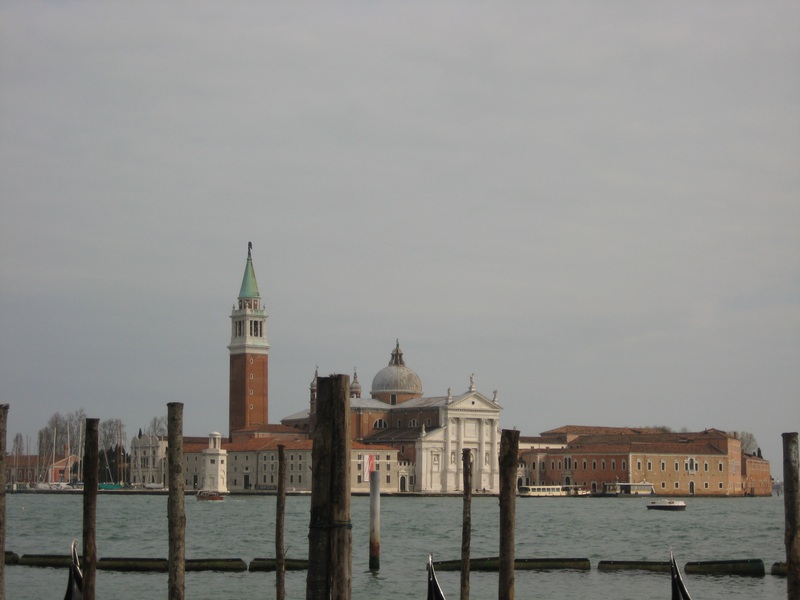 Venice and just hoping to get back again without any grievous damages. 8. Even today, the Italian Navy seems to be stationed in Venice. 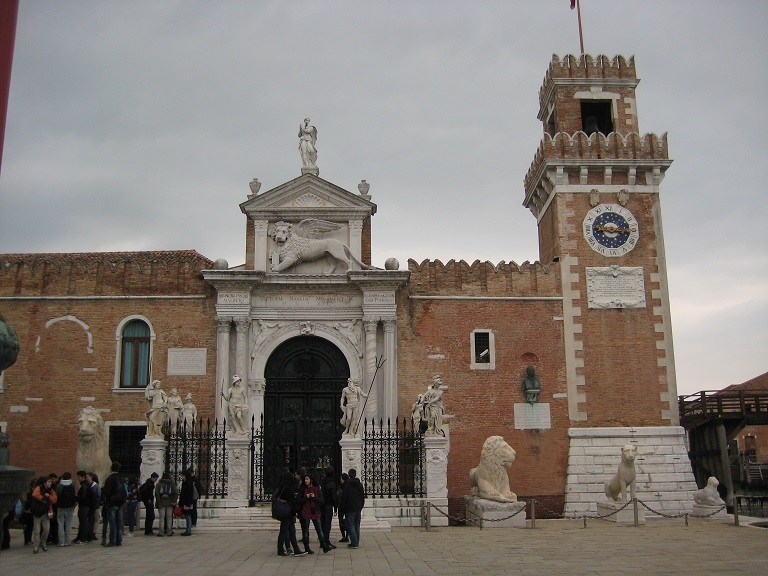 There were handsome young Italian Navy officers in dark blue coats leaving the area of the Venetian Arsenal. This was quite striking for a current reader of Hornblower (I feel a blog post on that coming up, for sure). The Venice Arsenal. Really impressive when you think of the seapower once behind it. I did not get a good photograph of the good-looking young navy officers, though. 9. Thanks to Magdalena, I had the information that a very short distance from the main tourist attractions might take you to another world. Now, my uninformed spontaneous ambition was to go to the Isola St Pietro. I promptly got lost after the Pizza San Marco (Look at Google Maps and decide if you wouldn’t have been so, too). 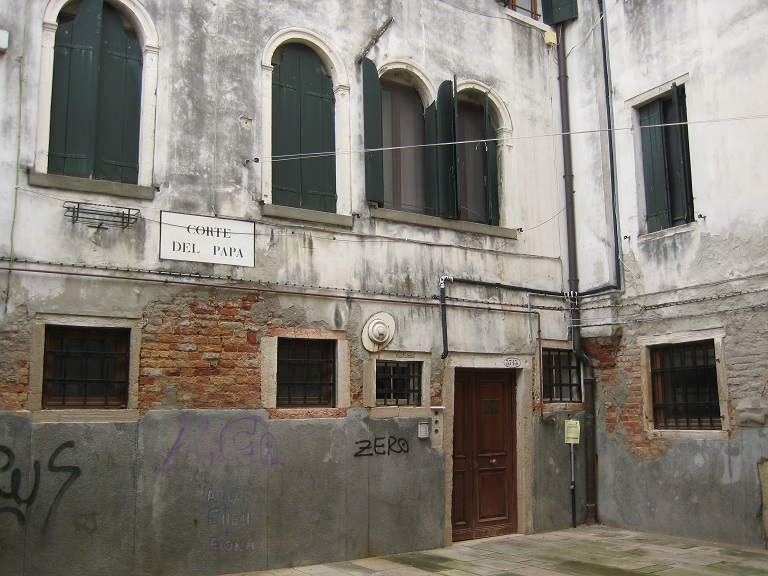 And I found myself in places of even more charming decay, and washing drying on lines spanning the narrow lanes, and not seeing a living, breathing human being for minutes on end, just some 10 minutes from St. Mark’s. Now these places are extremely picturesque and romantic and they probably do not set out to rip of tourists as they do elsewhere (in fact here is where handsome young Italian barkeepers let you use toilets for free), but still everything is rather expensive here. And yet, curiously real, not at all Disneyfied, from the man going walkies with his dog [insert here peculiarities connected with walking your dog in an amphibious lagoon city], to what our British friends would call working class people going shopping with bags and little trolleys (no cars there, remember) in the more remote parts of Old Town Venice. A building site. No cars. 10. Unless you are awfully acutely in love with someone (I wonder: would this be a sufficient excuse?) – do not go by gondola. Smile charitably at the gondoliere, and take a bus. Or whatever they call it there. 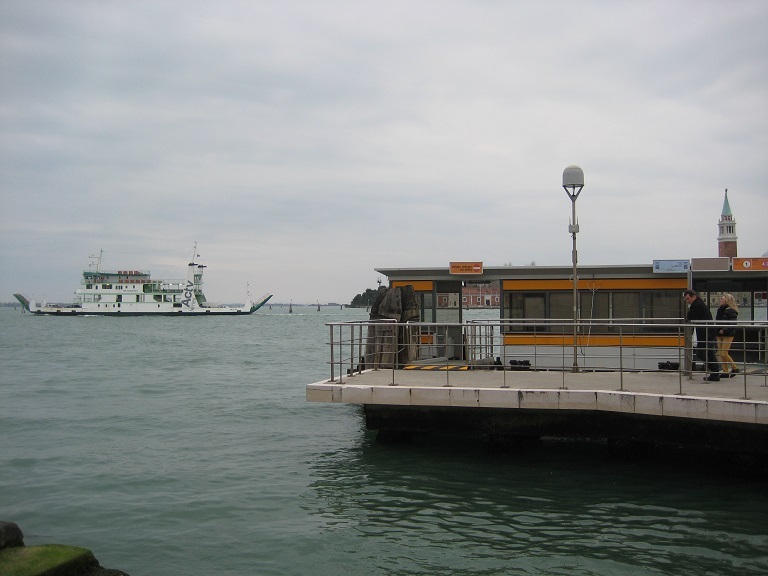 I did not do it, but given that public transport is on the water, in cannot be ruinously expensive, and this would be what I’d do most certainly do the next time I was in Venice. A ‘bus’ (or whatever) stop. 11. You might think, with your night train leaving at 10 pm, and your cunning (see points 2, 4, 9 and 10) having you saved quite some money, you might have a beer before taking your train. Well, what do you think prices are for a beer (0.3 l) drunk at a table in the vicinity of ~10 min walk of the station? You say 8 €? Congratulation, you have won full points. If you do not like this, you might wish to try an entirely new experience: drinking (non-too bad Dutch) beer from a tin (only 3 €) on the stairs in front of the railway station. Although it being Venice St. Louis Railway Station, with a view on the Grand Canale, might rob it of some of its sordidity. Did you see St Athanasius? I believe he is there somewhere. Golly – yes and no. As I said, I went to Venice in an entirely unprepared and unplanned way, so I made no research at all. I only checked now – and I actually went to the Chiesa di San Zaccaria where the relics of St. Athanasius rest, and did not know he was there! I was amazed by unexpectedly finding Bellini’s ‘Sagrada Conversazione’ there, but I did not check about the relics. This is just what I mean: there might be the most impressive relics in a Venetian (or, generally Italian) church, but you will have to discover it for yourself, because they have so many that they do not bother to point them out for you. So you went to Venice, how nice! 🙂 And so many beautiful pictures. You seem to have had a lovely sunny day there. 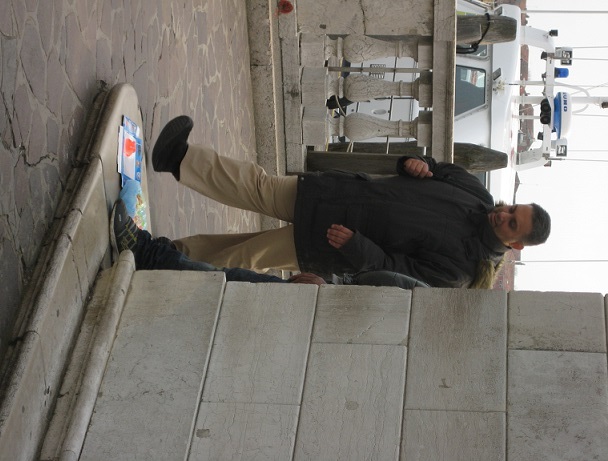 When I was in San Marco, there were huge crowds of people pushing each other through the main area. When I finally found the sarcophagus of St. Mark, there was only one other person there. Very nice, if you remember other places where you have only 5 seconds in front of the grave of a Saint because you get pushed along by other pilgrims. But then – St. Mark! That is not just some “random” saint, it’s St. Mark! One of the evangelists! That is really amazing! Why are there no masses of pilgrims? Not even the tourists seem to be interested in the person in whose honour this magnificent church was built. I think Fr Bede Rowe was meant to be in Venice today! I was in Venice three weeks ago and one of the things I liked the most was making a tour through the traditional bars of Venice, with a selection of typical wines and appetizers.